Pocket protectors have long gotten a bad rap for being “nerdy.” But these useful plastic pouches serve a valuable function. When you have a pocket protector, you will always have a pen handy and your shirt will never get ruined by messy pen stains. The big question is what kind of pocket protector you should wear. Choose a material that shows how tough you really are. Dispute the nerdy reputation of the pocket protector by making one out of duct tape. Cut a file folder or other heavy weight paper into a rectangle measuring 3 and ¾ inches by 5 inches. This is the front piece of your pocket protector. Cut a second piece into a rectangle measuring 3 and ¾ inches by 7 inches. This is the back of the pocket protector. Cut a third piece to 3 inches by 4 inches for the front flap. Wrap each of the three pieces so they are completely covered in duct tape. Lay the back piece of the pocket protector flat on a work surface. Lay the front piece directly on top of the back piece. Slide your hand between the two pieces to form the pocket. Loop two pieces of duct tape around the bottom. Slide the front flap section into the pocket protector. Fold it over so 1 inch hangs over the front. Fold the flap over the front of the pocket. Cut a 5-inch piece of duct tape. Place it into the pocket so the sticky side faces toward you. Secure the front flap with the tape. You are not limited to creating a silver pocket protector. 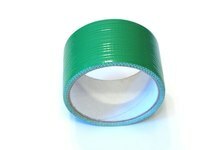 Duct tape is available in a wide range of colors.